You knew the second Darrius Heyward-Bey ran that 4.3 at the combine that Al Davis was thinking seriously about taking him at no. 7. How did the Broncos justify a RB with the 12 when they had all those problems on defense? Makes no sense. Philly adding Jeremy Maclin to Desean Jackson. Wow. Suddenly the Eagles have serious speed at WR. Had a feeling the Steelers would ignore their offensive line and take the best defensive linemen available. Just didn't think it would be Ziggy Hood. Denver traded a 2010 1st round pick to draft Alphonso Smith? Really? I guess that says a lot about what Denver thinks of their cornerbacks, huh, Champ Bailey? Somebody needs to tell Josh Freeman when to be quiet. Apart from the fact that the Buccaneers picked a first-round quarterback not long after signing Leftwich, the first-round quarterback who joined the team on Saturday said that the Bucs told him the addition of Leftwich was merely aimed at throwing people off. Freeman telling the world that the Bucs telling the world that Leftwich's signing in Tampa it was all a smokescreen....not the smartest move in all the world. Jacksonville took Eugene Monroe in the first round and Eben Britton in the 2nd. Wonder where they felt their problems were last year? My God, New England knows how to do the draft. First they trade down—which makes a ton of sense in a weak draft—and get a bunch of extra picks. Then all they do is set up with the future, taking Patrick Chung to step in for the Jurassic Rodney Harrison. Then they get Darius Butler in the 2nd round when most thought the pats would take him in the 1st round, and also get Ron Brace to eventually step in for Vince Wilfork. When does Braylon Edwards get traded? With Robiskie and Massaquoi both taken by Cleveland in the 2nd round, it seems that Mangini has seen enough of Edwards, and he should be traded by 5pm Sunday. Still a bunch of good players available. Jarron Gilbert, Rashard Johnson, Andre Brown, Kraig Urbik, Jaman Meredith. 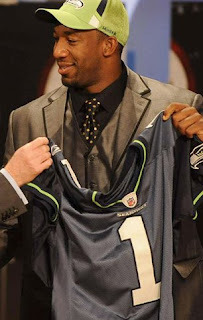 Johnson might look good in a Texan jersey, Brown in a Seahawk uniform. Buffalo could use a LT, and Meredith might get a shot there. And lastly, Aaron Curry wins with suit of the day.